Vintage and ethereal prom dress designed by Flair is a must have. Style 19104 showcases a modest v-cut neckline featuring well adjusted straps that are beaded. 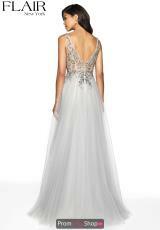 The beaded bodice shows off an intricate pattern that highlights itself from the rest of the dress. The skirt is made with fluffy tulle and a high slit.